Wheat germ agglutinin binds specifically to N-acetylglucosamine in the peptidoglycan layer of gram-positive bacteria. 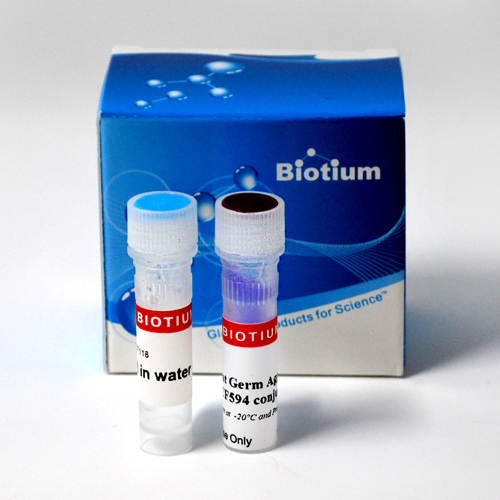 The Live Bacterial Gram Stain Kit contains wheat germ agglutinin (WGA) conjugated to CF®594 to stain the surface of gram-positive cells with red fluorescence. CF®594 is spectrally similar to Texas Red®, but with brighter fluorescence. 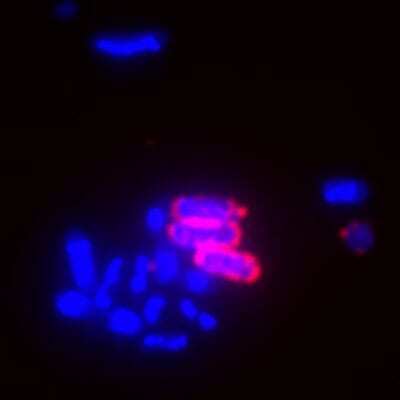 The kit also includes DAPI to stain the DNA of all bacteria with blue fluorescence. Gram-positive bacteria stained using this kit will show a fluorescent blue interior and fluorescent red cell surface, while gram-negative bacterial will be stained with blue fluorescence only. Texas Red is a registered trademark of Thermo Fisher Scientific. PMAxx™ dye is a DNA modifier used for viability PCR, invented by scientists at Biotium. PMAxx™ is a new and improved version of our popular viability dye PMA (propidium monoazide). PMA-Lite™ LED Photolysis Device is specifically designed for photoactivation of PMAxx™, propidium monoazide (PMA) and other similar dyes. The Yeast Viability Staining Kit is a fluorescent assay to determine yeast viability. Each kit contains two fluorescent components, CF® Dye-labeled Concanavalin A (ConA) and Live-or-Dye® viability dye.